I’ve been having a very frugal month. From keeping a close eye on our food budget to simply not buying anything unnecessary, October has been very good to me. And not to brag too much, but I also scored this still shrink-wrapped box of pint-and-a-half jars, which included the lids and rims. Not too shabby for $4.99. (I didn’t end up needing the jars, but I will use them for bulk storage as they take better advantage of vertical space. When I got home from Goodwill, I saw that a neighbor was having a tree chipped. (We had a big wind storm on Saturday, so our local arborists have been busy, busy, busy!) I walked over and asked if they’d dump the mulch in my driveway. I’ll use the mulch to freshen up the walkway along the side of our house, as well as under the hydrangeas and any other plant that sits still. And if there’s any left over, I’ll put a free ad on Craigslist. I just love how perfect this scenario is. My mulch didn’t have to be created hundreds of miles away, and by taking it, I save the arborists from having to haul and pay for dumping fees. Win-win-win! 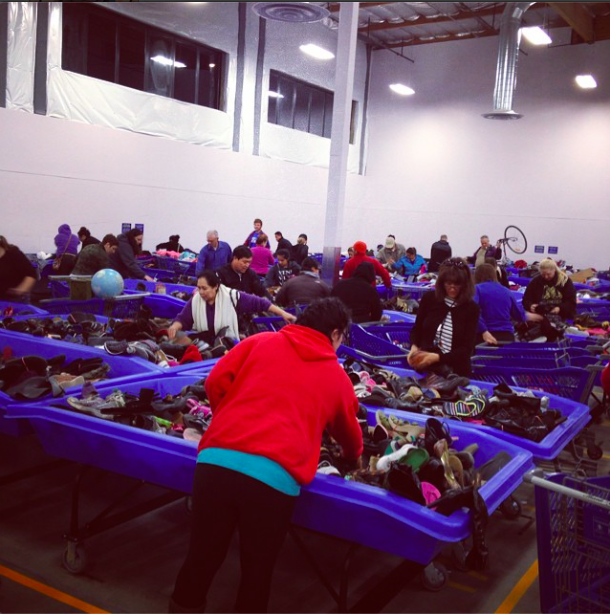 By 7:15, it was business as usual, with the serious pickers separating the wheat from the chaff. I kept to the perimeter and let the professionals do their jobs. I’ll write up a full post soon enough, but for now you’ll just have to imagine the amazingness. That mulch was a super win. Do you have a fireplace or outdoor firepit? I think the bigger bits that resisted the power of the mulching machine would still make great tinder, and allow you to use the smaller bits where you need them as mulch. We do have a fireplace, so that’s a great idea. I’ll remember to set them aside for kindling. Thanks! I have serious applesauce envy – I’m going to have to do something about that! 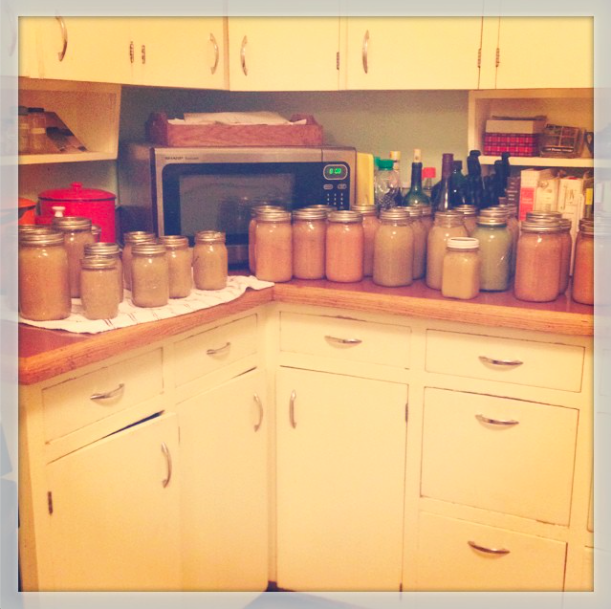 35 jars of apple sauce *might* just make it half a year in my house, but I love the idea of not buying it every week. Over the past few months, I hadn’t been shopping at Goodwill much, but this weekend my family will be attending a wedding and it’s supposed to be cold and rainy. I scored a sweater dress for $5 (plus a slip and belt) and a cute sweater vest for my 5 year old for $2.50. I’m determined to keep my family toasty! Great deal, I love it! How long do you think the 35 jars of apple sauce will last you? That’s a lot of sauce! I also use it as gifts. I’ve given small jars to a neighbor and my son’s teacher, and then I gave my father a large jar as a thank you for letting me borrow his applesauce maker. I’ll use them as holiday gifts as well. Very Cool on the mulch!!! I may have gotten a slightly better canning jar deal at a garage sale this summer ($2 for 2 dozen assorted quart jars), but you completely outdid me (and, I’m guessing, a lot of other folks) on the applesauce project. That sort of thing needs the kind of energy I can’t muster any more, if indeed I ever could. 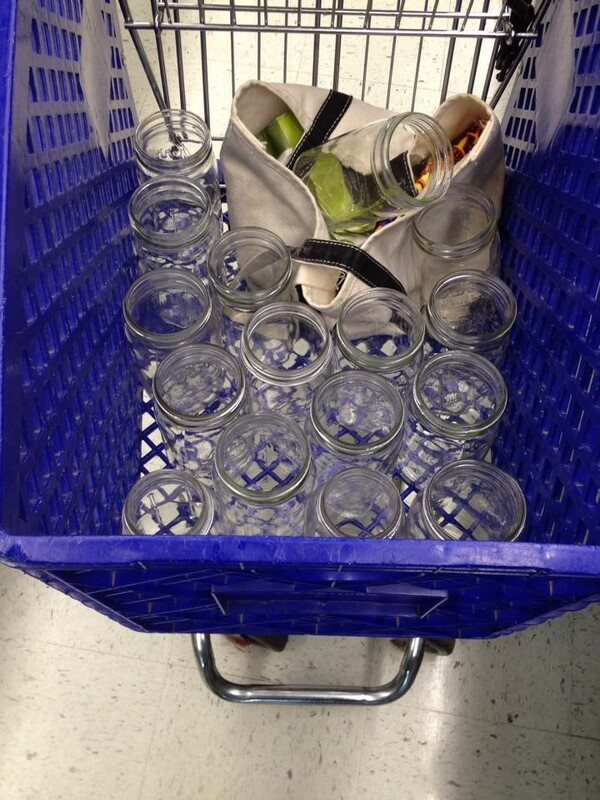 (I scooped up the 2 dozen quart jars for refrigerator pickles and other easier projects.) 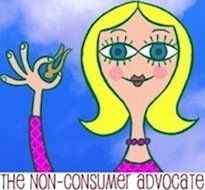 Fortunately, nonconsumerism isn’t–or at least shouldn’t be–a competitive sport! Also, those Ball pint and a half jars are a novelty to me. I’ve never seen them around here, and that would indeed be a useful size. My right arm is extremely sore from cranking my “Squeezo-Strainer” applesauce maker! They are hard to find anywhere. I usually get that size on amazon. I gift in them a lot, (apple sauce, caramel sauce, homemade hot chocolate mix, those layered soup mixes…) and the quilted jars are super pretty. All it needs. is a bow! After Christmas, some towns will mulch Christmas trees that have been dropped off, and citizens can haul it away for free. Also good job on the 1.5 pt jars–those are harder to find and my favorite size! Jealous. I have serious canning jar envy! 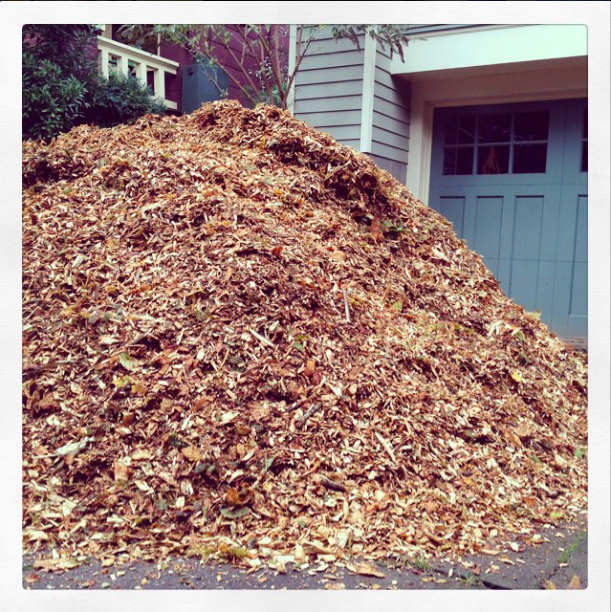 And mulch envy! Way to go Katy! I notice the little red index box in your kitchen photo. I have one just like it–I use mine for recipe cards and it’s one of my favorite old things. It was my mom’s when she was a girl (she’s now 70) and has here handwritten maiden name on it. I smile everytime I get a recipe out of it. It reminds me that old can be so much better than new! Just wanted to share! 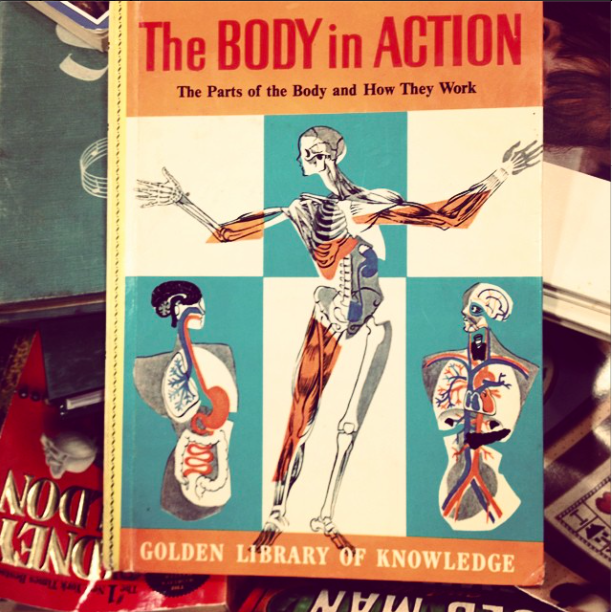 I recognize The Body In Action from my grade school days. My best canning jars deal was years ago when I was walking with the kids and saw a recycling bin full to the brim with glass canning jars, lots with rings, a few streets over from our house. I did knock on the door and ask if they were okay with my taking them (because I was going to have to go back for the car) and they thought I was nuts, but said it was okay. 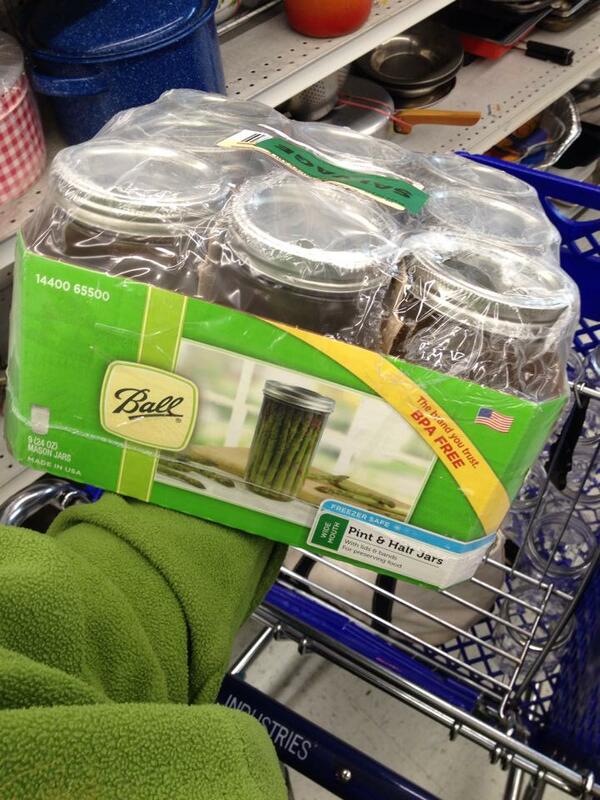 I have a bunch of pint and a half Barilla pasta sauce Mason jars that I love to use for many things in the kitchen. I love your haul. Thank you for coming so early to watch the events of the Airport Way Outlet Grand Opening unfold. Your attention to detail and happy energy made my day. (I hope swapping your scheduled Thursday for a Saturday, so you could attend, was great decision in the end). You are such a fantastic gal! Luckily, I’m used to having to be at work at 7:00 A.M., so it wasn’t too much of a shock to the system. Thank you for including me in the festivities!